Marek M, Horyniecki M, Frączek M, Kluczewska E. Leukoaraiosis – new concepts and modern imaging. Polish Journal of Radiology. 2018;83:76-81. doi:10.5114/pjr.2018.74344. Marek, Marta, Maciej Horyniecki, Michał Frączek, and Ewa Kluczewska. 2018. "Leukoaraiosis – new concepts and modern imaging". Polish Journal of Radiology 83: 76-81. doi:10.5114/pjr.2018.74344. Marek, Marta et al. "Leukoaraiosis – new concepts and modern imaging." Polish Journal of Radiology, vol. 83, 2018, pp. 76-81. doi:10.5114/pjr.2018.74344. Although leukoaroisosis was first described by Hachinski 30 years ago, it has remained an important and widely studied research topic, especially regarding its aetiology and clinical correlates. The term leukoaraiosis refers to neuroimaging abnormalities of the white matter, which appear as hypodense or hyperintense areas, are located predominantly in the periventricular area, and are found especially in older people [1,2]. The term was originally coined by Hachinski in 1987 (leuko – white, araiosis – rarefaction), and it referred to the ischaemic abnormalities observed in the deep white matter of the brain. The appearance of leukoaraiosis depends on the imaging method used, but typically it presents as multifocal or diffuse periventricular or subcortical lesions of varying sizes. These lesions have a hypoxic-ischemic aetiology, with axonal atrophy and consequent gliosis that occurs due to an interplay of numerous factors [1,3]. Leukoaraiosis is caused by hypoxia-ischaemia that results from diseases of the small vessels, typically the thalamostriate arteries and other perforating arteries. However, there are controversies regarding the causes of stenosis or occlusion of these vessels. With aging, arteries loose elasticity due to accumulation of atherosclerotic plaques, amyloid, and hyalinisation, which leads to ischaemia and gliosis with consequent neurotransmission disorders [1,4]. Hypoxia-ischaemia is supposed to play a role in the aetiology of leukoaraiosis; however, it is not certain whether it is a primary or a secondary cause, i.e. whether decreased blood flow is the cause or effect of nerve cell damage . Another hypothesis focuses on blood-brain barrier breakdown and endothelial dysfunction [1,4,5], with haemodynamic disturbances and damage of the blood-brain barrier being interpreted as elements of endothelial dysfunction . The blood-brain barrier damage is reflected by the presence of plasma proteins such as IgG, complement, and fibrinogen in patients with leukoaraiosis. Thus, it is supposed that brain damage is due to toxic effects of blood proteins on nerve cells . Although the pathogenesis of leukoaraiosis is not completely understood, it is thought that its prevalence increases with age , especially in people over 60 years of age . Other risk factors include female gender, hypertension, heart diseases, type 2 diabetes, abdominal obesity, hyperlipidaemia, hyperhomocysteinaemia, carotid stenosis – patients with stroke and leukoaraiosis have an increased thickness of the intima-media complex [2,6], history of stroke, tobacco use, alcohol abuse, and chronic kidney diseases [1,3-6]. Notably, some studies have shown that age and the intima-media thickness are more strongly associated with leukoaraiosis than other cardiovascular risk factors, and the severity of carotid atherosclerosis reflects the severity of white matter lesions . Leukoaraiosis is associated with stroke - especially lacunar stroke, vascular dementia, and Alzheimer’s disease [4,7]. An increased rigidity of small arteries in patients with Alzheimer’s disease or vascular dementia suggests a causal relationship between this finding and these diseases . Some studies have found an association between leukoaraiosis and depression or mood disorders, as well as disability in elderly people [3,4,6]. The clinical picture of patients with leukoaraiosis is diverse and includes motor deficits, frequent falls, parkinsonism, and pseudobulbar syndrome [1,4,5]. It has also been shown that most patients with neurological deficits and leukoaraiosis also have cognitive impairment . Leukoaraiosis is also regarded as an independent risk factor of death in people with vascular disorders. Similarly, leukoaroisosis increases the risk of stroke and myocardial infarction, and predicts complications of stroke, such as epilepsy, pneumonia in the acute phase of stroke, and trauma due to falls resulting from motor deficits [1,4,6]. The presence of leukoaraiosis does not influence the management of patients after stroke or transient ischaemic attacks (TIA) ; however, adequate care should be given when administering oral anticoagulation as secondary prophylaxis of ischaemic stroke in patients with leukoaraiosis because of a perceived increased risk of intracranial bleeding . Notably, hypertension is a risk factor for both leukoaraiosis and intracerebral bleeding . The risk of bleeding cannot be estimated based on the location or severity of leukoaraiosis, but the extent of leukoaraiosis might correlate with bleeding risk [4,6]. The term leukoaraiosis was introduced based on computed tomography (CT) images, but leukoaraiotic lesions can be visualised with magnetic resonance imaging (MRI), especially with SE T2, and FLAIR sequences . Typically, leukoaraiotic lesions are multifocal or diffuse, with indistinct borders , are most commonly located in the proximity of the cerebral ventricles or within the semioval centre and appear hypodense in comparison to normal white matter on CT images. On MRI, these lesions are hyperintense on T2 and FLAIR images [1,2] (Figures 1 and 2). Based on neuroimaging, the severity of leukoaraiosis can be assess using various scales, depending on the imaging modality used, i.e. CT or MRI . Leukoaraiotic lesions can be found earlier on MRI, hence they do not always co-occur with neurological deficits. In contrast, such a correlation between radiological appearance and neurological deficits can be observed in the case of CT because the lesions found on CT reflect a greater severity of neurodegeneration . Among the many CT scales that are used for grading the severity of leukoaraiosis are those developed by Erkinjunttiet et al. in 1987, Rezek et al., as well as the scales published in 1991-1995 by Blennow et al., Charletta et al., and Lopez et al. . However, the scale developed in 1992 by van Swieten et al. has been used most commonly both for CT and MRI. In this scale, the “anterior” and “posterior” portions of each brain slice are evaluated separately at the level of the vascular plexuses of the posterior ventricular horns, the central part of the lateral ventricles, and the corona radiate, according to the following grading score: 0 – no lesions, 1 – partial involvement of the white matter, and 2 – involvement extending the subcortical areas; the maximum score is 4 for the “anterior” and “posterior” parts . With the advancement of MRI, several scales for this modality have been proposed for assessing the severity of white matter involvement, ranging from simple dichotomous scales to numerous detailed scales put forward by Awad et al., Gerard and Weisberg, Figiel et al., Schmidt et al., Scheltens et al., Breteler et al., Victoroff et al., Manolio et al., and Fukuda et al. . It should be noted that the scale developed by Fazekas et al. in 1987 has been used most commonly in clinical practice. This four-point scale assesses periventricular white matter (PVWM) involvement and deep white matter (DWM) involvement. The grading system for the periventricular matter is as follows: 0 – no lesions, 1 – “caps” or pencil-thin lining, 2 – smooth “halo”, and 3 – irregular periventricular signal extending into the deep white matter. The grading system for the deep white matter is as follows: 0 – no lesions, 1 – punctate foci, 2 – beginning confluence, and 3 – large, confluent areas . Advanced white matter lesions, with a score of 3, are morphologically similar to leukoaraiosis. It is difficult to ascertain which of the above-described scales is the most precise. Some of them emphasise the size and number of lesions, whereas others assess the percentage involvement of the white matter or halo-like and pencil-thin lesions. The majority of scales, at least to some degree, refer to the anatomical areas in which leukoaraiotic lesions tend to occur. Owing to a better tissue resolution, MRI enables detailed analysis of leukoaraiotic lesions. As regards simple scales, evaluation of the severity of leukoaraiosis can be difficult due to the subjective nature of assessments and the experience of the rater. On the other hand, using complex and time-consuming scales may not be feasible in busy clinical settings. Based on a review of the relevant literature, we found the scales of van Swieten for CT and Fazekas for MRI to be the most commonly used in clinical practice. Lesions that are similar to leukoaraiosis can be found in adult patients with other diseases, such as Alzheimer’s disease, vascular dementia, amyloid angiopathy, cerebral autosomal dominant arteriopathy with subcortical infarcts and leukoencephalopathy (CADASIL), Binswanger’s disease, hypertensive encephalopathy, after chemotherapy, soft tissue diseases, multiple sclerosis, HIV, and Hashimoto encephalopathy [3,6]. According to recent reports, classifications of small vessel diseases, which are based on aetiology, specify diseases associated with atherosclerosis as a separate category; other categories include inflammatory and autoimmune diseases, such as Wegener’s granulomatosis, Churg-Strauss Syndrome, Schönlein-Henoch disease, and soft tissue diseases – Sjögren syndrome, scleroderma, rheumatoid angiitis, and systemic lupus erythematosus. Other categories include hereditary amyloid angiopathy and other hereditary diseases that are not associated with amyloid deposition, such as CADASIL, cerebral recessive dominant arteriopathy with subcortical infarcts and leukoencephalopathy (CARASIL), mitochondrial encephalomyopathy, lactic acidosis, stroke-like episodes (MELAS), and Fabry disease . Recently, new research has been published that is in line with previous hypotheses regarding the aetiopathogenesis and clinical picture of leukoaraiosis. Junying Shi et al. proposed that leukoaroisosis is associated with age – with greater prevalence in people over 60 years of age, hypertension, history of cerebral bleeding, ischaemic stroke, lacunar stroke, and hypertriglyceridaemia . Other researchers regard leukoaroisosis as an independent predictive factor of cognitive function impairment after mild ischaemic stroke (NIHSS ≤ 5) . Based on recent reports, leukoaraiosis is an important cause of disability, cognitive function impairment, gait disturbances, incontinence, dysarthria, and, most importantly, ischaemic stroke. Diseases that co-occur with leukoaraiosis include well-known stroke risk factors, such as hyperhomocysteinaemia, hypertension, dyslipidaemia, diabetes, tobacco use, ischaemic heart disease, history of lacunar stroke, atrial fibrillation, and chronic renal failure . Based on current stroke management guidelines, mild or severe leukoaraiosis (2-4 points on the scale by van Swieten) negatively influences clinical outcomes in patients after recanalisation of cerebral vessels in the acute phase of ischaemic stroke . Notably, Urška Lamot et al. reported in 2017 that the central vein sign on SWI-MRI is not only characteristic for multiple sclerosis but is also frequently found in small vessel diseases associated with leukoaraiosis . As regards multiple sclerosis, the central vein sign is explained by perivascular inflammatory infiltrates around central veins; in leukoaraiosis, it can be due to signal void in central veins that is seen against the background of gliosis. Asian neurologists have also shed new light on the pathogenesis of leukoaraiosis and its relation to small vessel diseases. They have found a relationship between leukoaraiosis and retinopathy in patients with anterior circulation stroke . In 2013, an international group of researchers characterised neuroimaging features of small vessel diseases . These features include recent small subcortical infarcts, lacunes, white matter hyperintensities, periventricular spaces, microbleeds, and brain atrophy. 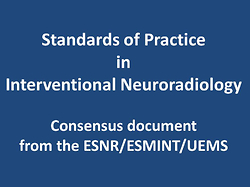 Unification of radiological terminology is important because lesions associated with small vessel diseases are the most frequent cause of vascular dementia, and to date, numerous terms with differing definitions have been used in both research and clinical practice. Based on the above-mentioned statement, leukoaraiosis, similarly to other symmetrical T2-hyperintese and CT-hypodense white matter lesions, is thought to have a vascular aetiology in contrast to other diseases, such as multiple sclerosis and leukodystrophies, in which similar lesions have a different nature . Leukoaraiosis is a significant risk factor of ischaemic stroke as well as neurological and cognitive impairment. Leukoaraiosis and its severity, which can be graded on numerous scales, is associated with negative outcomes in the acute phase of stroke and after stroke, and is an independent risk factor of recurrent stroke; thus, patients with leukoaraiosis required special care. Based on our own experience and the available literature regarding MRI-hyperintense and CT-hypodense white matter lesions, we suggest that leukoaraiosis should be redefined because many other white matter lesions have a similar neuroimaging appearance that is not due atherosclerotic changes in small vessels. 1. Zagrajek MM, Pokryszko-Dragan A. Charakterystyka i obraz kliniczny leukoarajozy. Udar Mózgu 2005; 7: 56-60. 2. Ben-Assayag E, Mijajlovic M, Shenhar-Tsarfaty S, et al. Leukoaraiosis is a chronic atherosclerotic disease. Scientific World J 2012; 2012: 532141. 3. Helenius J, Tatlisumak T. Treatment of leukoaraiosis: a futuristic view. Current Drug Targets 2007; 8: 839-845. 4. O’Sullivan M. Leukoaraiosis. Pract Neurol 2008; 8: 26-38. 5. Rościszewska-Żukowska I, Kwolek A, Kruk W, Cichocka I. Występowanie leukoarajozy u pacjentów z udarem mózgu hospitalizowanych w oddziale udarowym. Prz Med Uniw Rzesz Inst Leków 2013; 3: 288-297. 6. Mijajlović MD, Pavlović AM, Mirković MM, Šternić N. Connection between leukoaraiosis and ischemic stroke. Curr Top Neurol Psychiatr Relat Discip 2011; 19: 41-47. 7. Kearney-Schwartz A, Rossignol P, Bracard S, et al. Vascular structure and function is correlated to cognitive performance and white matter hyperintensities in older hypertensive patients with subjective memory complaints. Stroke 2009; 40: 1229-1236. 8. Scheltens P, Erkinjunti T, Leys D, et al. White matter changes on CT and MRI: an overview of visual rating scales. Eur Neurol 1998; 39: 80-89. 9. Pantoni L. Cerebral small vessel disease: from pathogenesis and clinical characteristics to therapeutic challenges. Lancet Neurol 2010; 9: 689-701. 10. Shi J, Hao K, Qi P, et al. Confirmation of the abnormal lipid metabolism as a risk factor for the disease of leukoaraiosis. Saudi J Biol Sci 2017; 24: 508-513. 11. Zhang Z, Ren W, Shao B, et al. Leukoaraiosis is associated with worse short-term functional and cognitive recovery after minor stroke. Neurol Med Chir (Tokyo) 2017; 57: 136-143. 12. Wadia RS, Ghiya SK, Singh J, et al. Clinical correlates of leukoaraiosis: A study of 175 patients. Ann Indian Acad Neurol 2016; 19: 478‐481. 13. Gilberti N, Gamba M, Premi E, et al. Leukoaraiosis is a predictor of futile recanalization in acute ischemic stroke. J Neurol 2017; 264: 448-452. 14. Lamot U, Avsenik J, Šega S, Šurlan Popovič K. Presence of central veins and susceptibility weighted imaging for evaluating lesions in multiple sclerosis and leukoaraiosis. Mult Scler Relat Disord 2017; 13: 67-72. 15. Wei W, Xia Z, Gao H, et al. Correlation of retinopathy with leukoaraiosis in patients with anterior circulation infarcts. J Clin Neurosci 2016; 33: 105-110. 16. Wardlaw JM, Smith EE, Biessels GJ, et al. Neuroimaging standards for research into small vessel disease and its contribution to ageing and neurodegeneration. Lancet Neurol 2013; 12: 822-838.